May 11, 1938 - October 7, 2016 Edward J. Flynn passed away peacefully at his home in Osprey, Florida. He is survived By his wife, Margaret, sons Daniel and Greg, daughter-in-law Lynne, grandchildren, Alysia, Heather, Connor, Jasmyn, Brandon and Aidan and sisters Carole Shingle and Louise Harmer. 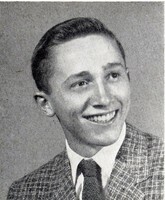 Born and raised in Easton, PA., Ed graduated from Princeton University in 1960 with an engineering degree and was commissioned in the U.S. Navy. After completion of his service, he received his Master's Degree from NYU and held successful positions at Grumman Engineering Corporation and Squibb Pharmaceutical Company. In 1968 he accepted a position with Operations Research Inc., a consulting company in the Washington, D.C. area, prior to joining The Energy Information Agency, the forerunner to the Department of Energy. Ed and Margaret raised their sons in the Maryland suburbs of Washington, D. C. and lived there for 35 years. Ed volunteered much of his time to coaching wrestling and baseball for the Wheaton boys Club. In 2003 they retired to the Sarasota area and joined Mission Valley Golf and Country Club where they enjoyed many rounds of golf and wonderful friends. A Celebration of Edwards Life will be held on Saturday, November 5, 2016, 2:00 pm at Venice Presbyterian Church. Burial will take place at the Sarasota National Cemetery. In lieu of flowers, please make donations to the National '02httpAlzheimer's Association or Tidewell Hospice, Sarasota, FL.